Thanks again for posting this. I hope there’s more coming! The problem/time delay in releasing the next ones lies mostly in the fact they are spread out over several 1 mile hex maps...which each of them have to be created. . However that said, I am still busy creating. 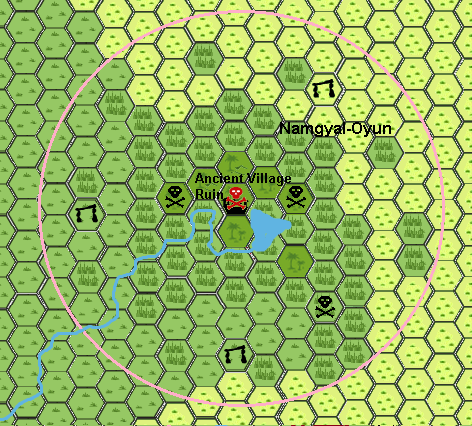 In the 1-mile hex map topic we had a discussion where lion Castle from the adventure Ghost of Lion Castle is located...I am busy creating this location, and background these days, as that region is now encompassed in the NW ethengar 1 mile hex map. Located near Horsefair site (southeast 9 miles). Exists since; unknown, estimated 3350 BC. The first discovery of Baldandars was in the Era of Blackmoor, according to ancient scriptures about 3980 BC. In that era and beyond strange visitation were on Mystara. There were rumours of a large vessel that crash-landed some hundreds of miles from the City of Blackmoor itself. Within the following years other vessels were seen, seemingly attracted to the first one. At least one of these unknown alien vessels crashed in the frigid tundra of Ethesh. It is unknown if it was discovered by the settlers of the New Blackmoor Colony, as no records were ever found in either the Fire Wizards Academy or the Great School of Magic extensive libraries or archives. Inside the vessel are still the skeletal remains of two large thin creatures with large bulging heads and grotesque large eyes. The description is equal to those of the recently (1012 AC) discovered Baldandars slain by adventurers, and researched by mages worldwide. All this information together makes illegal explorers of this location guess if both are not the same species. The unidentified vessels then and today all over Mystara may be related one way or another. It is known the vile predatorial Baldandar are able to alter their appearances by magical illusions to hide, and may have adapted to the overall environment of Mystara. As such it is assumed they could be found amongst the Gostai Goblins, where humans are eaten if captured. Unknown to the Gostai Goblins their illusion adept Wokani could actually be a Baldandar. It is clear that the vessels described today and in the past are a combination of magic and the creature’s abilities to create powerful tactile illusions, yet unsusceptible to magical dispelling. As being illusionary, they would normally leave no parts when crash-landed. Yet all the Hakomon and Gostai Goblins coming here, can see and feel the metal ruins. Could it be this vessel is real? Or is it still a powerful illusion. Then how could it sustain itself that long? And if it is real, where did it originate? Why and how did it fall here together with a large piece of meteoric rock? Legend; Nowadays Gostai Goblins speak of tales of a flying rock in the sky upon which the gods sat in their metal houses, spying on the world, when suddenly a god forgot to keep the rock aloft and it fell down. To them the location is the place where gods did die. The loot and plunder the remains for sharp pieces of steel; as it was created by the gods, it could easily kill a human. In effect the shard-like remains are lightweight metal weapons of dagger to sword size (and damage) with no magical bonus, but half the normal weight. They have a 25% to break if making a critical hit or if struck against solid steel or stone (in effect lowering the weapon by 1 dice). The weapon is however rust covered and will cause an normal infection (see here http://www.pandius.com/diseases_and_healing.pdf page 18). The goblins settled in this region due the hills and their massive maze of tunnels. Soon they discovered the crater and made use of the metal found. They must have derived their legend upon fantasy or divination. To the Ethengar the valley (as they call it) is a weird combination of rest, and death, silence and a mumble of activated thoughts. Spirits do not come here and this is seen as a blessing to several Hakomon. Last edited by Robin on Sat Jan 19, 2019 2:53 pm, edited 1 time in total. Wow, that's a lot a work ahead. I look forward to seeing them, and if you're enjoying writing them up then it doesn't feel much like work. Thanx Hugin ♥...compliments like these keep me working, and make me feel my work is appreciated. And since the NW 1mile and other hexmap grow these locations become more evident, more will soon follow, although not as rapid as I had imagined in the beginning. And although it is sometimes tedious or hard work, I still enjoy it ...helps me bugging RL frustrations, stress relief and passing time . Translation name; “Ghoul Lair”, "Burial Mound"
Used by; Shaman, Hakomon, and by regular Ethengar as burial Ground. Exists since; The location was created manually by the Ethengar already around 2000BC, when the ice and snow had receded north. They dug in the often still frozen ground, and from underneath they broke off pieces of frozen ground. Together with giant stone blocks (where they derived these is still unknown; it could be a magical creation, handwork from the Dwarves in the South, or even material from older Moadreg locations and settlements in the south-east) and the earthen blocks covering these on the outside they created nine huge circular domes with an A-shaped entry. Within this dome they dug single, family and communal graves. First in the year 1700BC these were covered with stone or backed clay plates. The domes together were buried with more ground to create one single several miles wide burial mound. As the Ethengar dug away the ground and frozen hills, and piled everything up one giant heap, they created sharp cliffs, which still exist here today. Volcanic pressure and short magmatic eruptions created areas of volcanic broken lands in the same area, and damaged the domes severely. Most now have volcanic caves nearby, which open into the domes and to the outside. The 1700BC disaster enabled the Sphere of Entropy to get a hold on this region. Many evil spirits appear here from Limbo or the Spirit Realm to dwell somewhere else. Effects; The combination of thousands of Ethengar dead over the centuries, together with the volcanic activity, and influences of the Sphere of Entropy make a large uncontrolled amount of undead. Only held at bay due the limited distances they could cover at night. As thus these ghouls can only be found in this region up to a distance of 12 miles away from the caves or tomb entrances; the maximum distance they could have covered walking by night and still return to a covered area. Then the sun rises causing exposed ghouls to slowly burn away as if exposed to a continual Turn Undead. The Power of the Sphere of Entropy is strong, and entropic spells are easier learned here (+15%) and control over undead is easier (double range and number). Memorization of Entropic spells takes half the normal time and its effects (even outside this location) are increased by 50%. Several Hakomon and even Shaman have become Ghoul Kings, but eventually all perish under the blades of Blessed Ethengar heroes. Any who stays within this doomed area longer than 24 hours (just enough to go in, bury somebody, and leave) has a 5% cumulative chance to adjust alignment one step closer to evil (lawful to neutral, neutral to chaotic, good to neutral, neutral to evil, one step of these at a time). Although the effects if the Earth are strong here there are no beneficiary effects to use Earth Elemental magic, other than that the caster or its elemental can’t become undead within this area. They will either die normally or heal. Sphere of Influence; 12 miles diameter. Last edited by Robin on Sat Jan 19, 2019 2:54 pm, edited 1 time in total. These are really great adventuring location which give extra life to Ethengar! Praises! THAT is precisly my goal and intent...making Ethengar more logical, interesting and ALIVE. 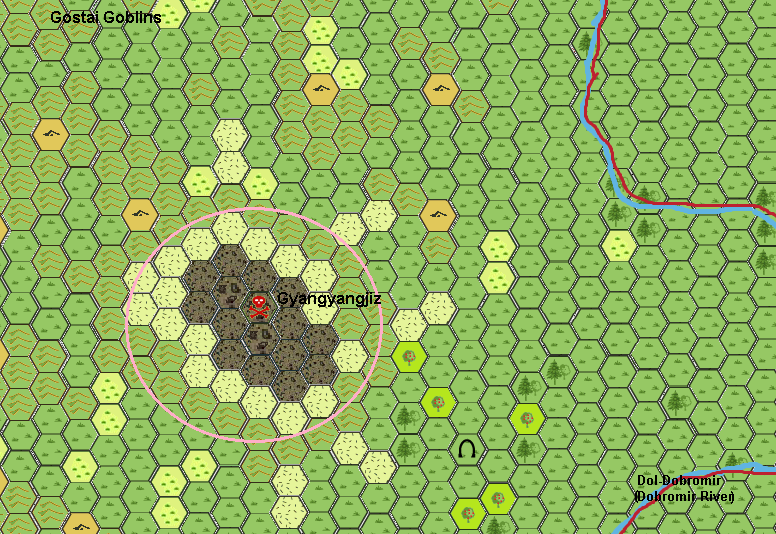 While infusing the 3050BC settlement locations from Sturm's 3050BC map I game upon the happy coincidence of the following location being both very fertile, and holding one of these ancient Blackmoor settlements of the New Blackmoor colonistst. Exists since; 3165BC. In the Blackmoor Era, this village (Wakefield see; https://sta.sh/02eghpmouwjw) next to a volcanic mineralised well, was for the New Blackmoor Colonists used as a research centre for biological genetic experiments. The first 45 years or so their work was especially research, but with the improved technological improvements, the local mages started to infuse variant Elemental magic within Plants. Within a decade they devised grain with an increased produce able to survive on even the poorest grounds. The plants were able to give high amounts of grain, and being a basic improved fodder for cattle and other herbivores. The yield was thus great that all these genetically enhanced seeds were transported to Blackmoor to be further improved and planted on the fields. It was these seeds which allowed the populace of Blackmoor to gain enough food to grow in number and power. It was these plants providing the high-energetic food for all the soldiers in the many Blackmoor wars. After this main discovery the research went beyond normal; the intent was to create plants with offensive or defensive means. Grab Grass was the first of this line of special plants. Soon more followed. All these plants were kept in several gigantic glasshouses all over the village, to be examined and improved. Then the Great Rain of Fire happened, the blast was thus great all technomantic devises attached to the main grid exploded. As such, were also the many energy conduits of the New Blackmoor colony, with their explosion, they not only stopped giving energy, but were also responsible for 90% of all direct deaths and destruction of settlements. The gigantic glasshouses were destroyed as within the village, and became a ruin. Nothing happened several centuries, except the ruins were overgrown, and Grab Grass seeds which survived the disaster were blown into the sky, following the global wind patterns, being deposited worldwide. Known History; It was in 1700BC, when the RCC collider exploded in the south creating the Broken Lands, and reactivating the volcanic system underneath the area, awakening the World Mountain Volcano, uplifting the Plateaux, and breaching interplanar borders infusing the area with Entropic and Spirit Realm influences. The old seeds were affected by the magical and Entropic powers and were reactivated, and new and dangerous examples became alive. The following plants were later discovered in this region by various humans, seeds were taken by mages and other explorers, causing these plants to appear on many other locations later. The whole area became slowly overgrown in an ever-growing mass of twines, twigs, vines, thorns and moving branches, expanding several miles. 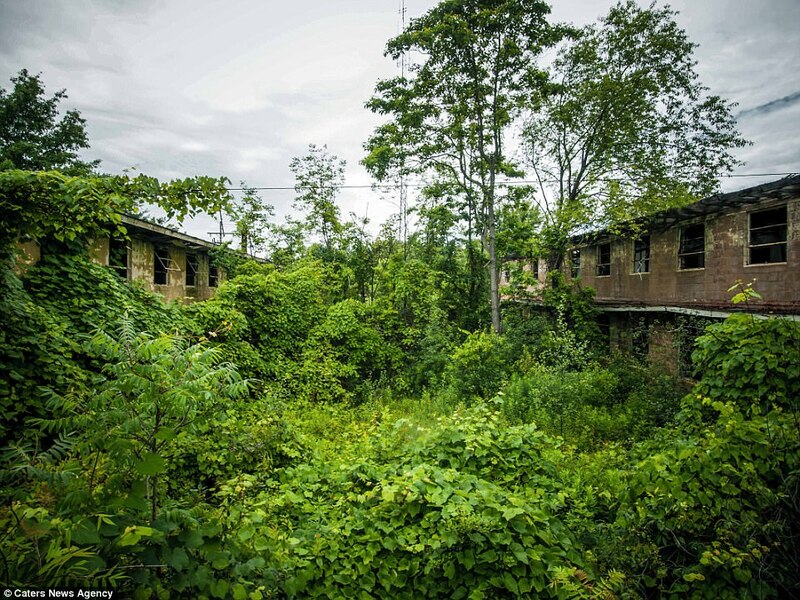 The jungle hexes used on the map reveal where the plants have grown in such a tumbling mass of roots, vines, and such they have grown to a heap of 50’ above the ground, with vine-like tunnels underneath. In 670BC it were the early Hakomon who together with the Dwarves created in a magical Henge-like system able to prevent further expansion of the plants. It is not a completely closed system, though and many seeds have found and will find their way into nature elsewhere. Either blown by the wind, transported by animals, or flowing in the water; it is still sure many seeds still originate here. The Henge-like system however, did prevent the magic of this location to grant explosive growth beyond the perimeter of the Henges. Within the area the dangerous plants, seem to shy away from the Henges, but grow abundantly elsewhere. Hence the system was called a "Oyun" aka a game Namgyal was the dominant Hakomon who controlled the henge construction. Amongst these plants was also a Yellow Musk Creeper, covered by the tick layer of vines and other plants from the sunlight. This plant succeeded to attack some local humanoids and Ethengerians, and make them into its “living” appendages used in the vine tunnels, and within the area of Entropic effect. Due this the plant succeeded to multiply in the area, and the Yellow Musk Zombies from the three mother plants(see black skulls on the map) can be found anywhere close to this area. However, as being affected by sunlight, any zombies will whither away in a half a day exposed to the sun. This vulnerability keeps these ‘wandering seed-appendages’ from spreading. Some mages and Hakomon have captured these zombies in an attempt to save loved ones or as experiment, and were responsible for spreading these vile things to the underground realms on the continent of Brun. The first one was discovered in the Shadow Lands in 955AC. Effects; Meditating in this area is dangerous. Attacks can seem to come as sudden and unexpected, as the plants may seem inactive often, they react upon movement, CO2 exhaling, warmth, light sources. Especially at night only a Wall of Fire can keep one from being attacked. Any fire damage to vegetation will be overgrown within a day or so. The magical effect of the region increases the power of any plant and undead related spell. These will always be maximum range, HD, Hp, etc possible. Staying over 3 days in this area will cause the person to become sick, and die in 5+1d6 days as aggressive entropic affected plant spores are inhaled and attack the victim from within, causing a drop of constitution of 1 point for each affected day(affecting hp and other abilities as normal). A Cure Disease will kill the spores in 1d3 hours, enabling the person to heal in the same time he was sick. If the person is still alive after the initial infection, the spores will have lost the internal battle and the person will also heal as described above. Hakomon never overstay two days out of this danger. DM’s can use the following dangerous plants from http://www.pandius.com/Monster_Manual_3.pdf. but must not forget to read the chapter on Plants page 840-847. Giant Butterwort(862), Bloodthorn(863-864), Boring Grass(865), Grab Grass (872), Crawling Ivy(878), Mandrake(884-888), Pitcher Plant(894-895), Razorweed(896), Serpentweed(899), Sword Grass(918), Witherweed(927), Yellow Musk Creepers with yellow-musk zombies(932-934). Last edited by Robin on Sat Jan 19, 2019 3:01 pm, edited 1 time in total. Located in Ővs tengisiin (Sea of Grass). Legend; It was the Earth itself which gave Birth to Cretia. Aeons of pregnancy, and trembles, until Cretia came to be. And every 11th year there after he will be born anew, as Chaos can't exist in a world of constants. Every birth is chaos supreme in a world of order. And so it is with Cretia, every birth of him, will show the world his renewed might. (of course this is only a legend or just a tale to make things understandable the Ethengar know nothing about; it is however typical that creatures of cold come here often, without having been seen elsewhere going here; Like Frost Salamanders, White Dragons, Frost Giants, Rhemorhaz, Polar Bear, Arctic Fox, Polar Werebear, Frost Wolves, and similar(see other examples also in my Mystara Monster Manual Compilation books; http://pandius.com/mnstrmnl.html). Used by Hakomon, Wokani, illegal Glantrian Mages. Exists since; This Cryovolcano came to be in the year 1700BC when the geological activity was forced into increased activity due the cellular ruptures caused by the disaster in the Broken Lands. The Plateaux of Ethengar was pushed further up, the dormant or dead World Mountain Carbonatite volcano was reawakened, and many other geological and volcanic processes were increased or came to be. Amongst these was this weird volcano, spawned deep underground, but instantly attuned to the Sphere of Death. For several hundreds of years this area was known only for its tremors, and after 500BC for its upheaval. In the summer of 11AC the volcano broke the surface, instantly killing the local environment with its noxious gasses and extreme cold in a radius of 2 miles. Beyond this the gas was dispersed. In the following centuries the volcano was very regularly active (every 11 year exactly) and slowly increased in size. Effects; the area is 100% toxic to anyone in the sphere of influence during these eruptions which last 3d20 days. Only a Protection from Poison, Survival or similar spell enables life to resist the gasses. One to two miles outside the sphere of influence during an eruption, nausea and dizziness may be the result of the gasses, which last as long as neutralized, affected by strong wind (mostly) or the afflicted have moved from the region. The connection to the Sphere of Death draws on all external temperature and moisture, making the temperature 50 degrees lower than the ambient temperature (Winter months; -5°F to -25°F, Spring months;-10°F to -25°F, Summer months; 25°F to 5°F, fall months;-5°F to -20°F), it turns all precipitation in the spherical area into snow, hail or sleet, but thus further not affect weather. A Protection from Cold spell might be needed to prevent harm. The gasses and the magical connection to the Sphere of Death makes all precipitation to accumulate, and in the 91 years of activity the area has become a sizeable mount of ice and packed snow. Beyond 2 miles away from the crater the temperature rapidly normalizes, and allows ice and snow to melt, and turn the dry ground into an embankment of mud. The last eruption was 990AC, and the next is expected to happen in the summer of 1001AC, followed by another in 1012AC, and 1023AC. The Ice will accumulate, the magical sphere does however not increase, and thus all ice will eventually melt beyond its parameter of cold, filling the summer seasonal creeks. Hakomon, and all mages will notice an increase in range, duration and effect of any here memorized spell of Cold, Precipitation, Dehydration, Charm, Control, and Undead by 50%, even if cast outside the area. Any memorized Fire, Warmth, Transportation, or Evocation spell (not one of the above) will be reduced by 50% in range, duration and effect. Any ice taken from here and used in a potion having one of the above magical effects will have range, and duration or effect affected as described above. Any snow taken from here and used in a potion having one of the above magical effects will have range, or duration or effect affected as described above. Any snow or Ice used this way has a duration of no more than 11 weeks, after which any potion will lose its effects in total, becoming spoiled water with a bad taste, giving nausea if imbibed only. Anything else taken from this region (like the Red Mud)and used in a potion will have no effects whatsoever, bud bad taste causing nausea. The area also seems to random teleport a land based Cold creature from anywhere on Mystara every 11 days. These creatures might stay (residing in the caves) for a while, but eventually they will all leave on their own means of transportation. The location may also be haunted by Spectres, yet this will go elsewhere regularly due the Spiritlords who also regularly might come here. Last edited by Robin on Sat Jan 19, 2019 3:02 pm, edited 1 time in total. Now my great project (Great School of Magic in Detail) has been finished I now work on the Ethengar maps and hence the hakomon locations. So they will eventually all be displayed here. Exists since; two weeks after the Ascension of Cretia, who tried to disobey the Immortal Law of No direct Interference to Mortals. Effects; Nothing Taller or higher than 5’ above the ground can move through this area without being affected by a growing headache, which after an hour disables 1 random spell per hour, and lowers intelligence by 1 for each day in the area. Unknown to the Ethengar and all other mortals this area is affected by the remnants of Immortal Magic of Tubak and Cretia battling each other. Tubak won after several Turns, as being much stronger, yet the chaotic magic of Cretia used in an attempt to force him on the ground bound with the remnant magic attacks of Tubak and the already existing magic of this area, and its effects remain active to this day. There is no difference between the hills and the flat surface as the magic lies upon this area as if a thick blanket on an uneven surface. Due to this effect predatorial birds could not hunt here on smaller creatures and birds. As these smaller creatures nest and feed upon the small bushes, the also spread its seeds all over this area. Above a 100’ the magic has no effect. There will be natural predators in the area, but much less than normal; mostly these are the clever ones (crow, magpie), or the smaller ground-bound ones (cat, wolf), or the few fast ones (like hawk). Hakomon know the effect begins at 5’of the ground and hence bend. To be unaffected; all Hakomon and Shaman regularly meditating here are either smaller than 5’ or have developed over time a bend back/humpback. Meditating here enables spells if Energy or Entropy to have a double Duration…even instantaneous spells…which will also affect all in its normal radius of effect the second round. This however does not apply to spells requiring a touch…as if the living touch of the caster disturbs the doubling effect. Spells of transportation and charm are unable to be memorized or prayed for in this area. Last edited by Robin on Sat Jan 19, 2019 3:03 pm, edited 2 times in total. Always original and interesting locations! I am even thinking these 'witte wiev'n' are not single out on this location only, and maybe a more known thing to fear in the Heldann Freeholds, and many legends(see the Dutch wikipedia) and stories are known amongst the locals. Then this is the only location in Ethengar. As all the Locations in the NW are done, I now go south. 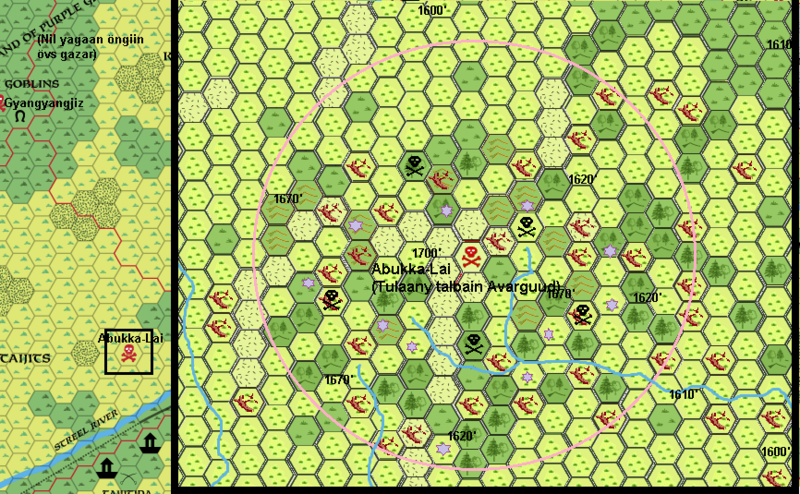 I have readjusted the small maps, which will be released in the final PDF. all links will then steer towards this PDF. Located 20 miles north and 21 miles west of the Dol-Stral River (Streel River), 2nd closest to Bargha (39 miles), near to horsefair site (northeast 26 miles). Legends; Aeons ago the giants came to battle Mankind. First mankind lot many battles until the moment in Ethesh they gained the power to control fire by steel and magic. The steel wagons they made all could blow out this special fire. One by one the giants fell. Shaman say Yamuga revolted against the global onslaught; Mankind, Elven, Beastmen, Giants, Dwarves, all against each other and oneself. And her plea of help was heard by Tubak. Then the Tubak high in the sky revolted, and spit forth its flame, the metal wagons exploded like a fireball, like the olde settlements did. Fire was everywhere the Rain of Fire came down. Nobody was spared, as the fire slew all warriors, until peace and silence was there. Exists since; In 3000BC (a few weeks before the Great Rain of Fire the military tools were placed until the Giants came). Although in reality neither Tubak, nor Yamuga had any influence or cause of the GRoF, they were shocked by its aftermath. Yamuga (Terra) was the first to investigate this terrain, and despite all her magic nobody could be saved. 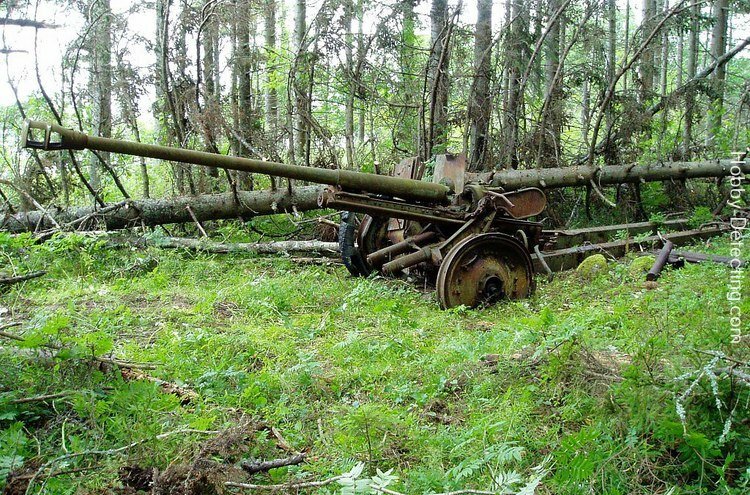 In 2300BC the humans and dwarves had discovered the metal ruins of the warmachines, and within these many not exploded Cylinders and Orbs of Destruction (Bombs). And again the field became a battlefield; they even say against the giants anew, others say against an identity known as the Troll queen and her minions. Either way, the battle was so powerful it devastated both sides of the combatants (both by successful use and failed use of the technomagic and items of destruction. The skeletal remains of the giants can sometimes still be found here. The moisture brought by Lake Anur (later named Grondheim Lake) enabled the area to become covered with a vast forestland, including several real woods. In 1700BC the area became Blighted (as the spell) due the technomagical energies still roaming around and Entropic Energies when the last remaining Orbs exploded together with the vast destruction and the Entropic effects brought in due the disaster which created the Broken Lands. Several other Entropic effects were also born and remain active to this day. Many trees here perished in the blast of the disaster or the dusty fallout, and left behind their stems, roots and branches. The following increase of the Grondheim Lake swallowed up most of the rest. Only the areas forested and not flooded remained somewhat forested, not woods, but sparse forest sections between the hunks of dead trees in overall grassland. 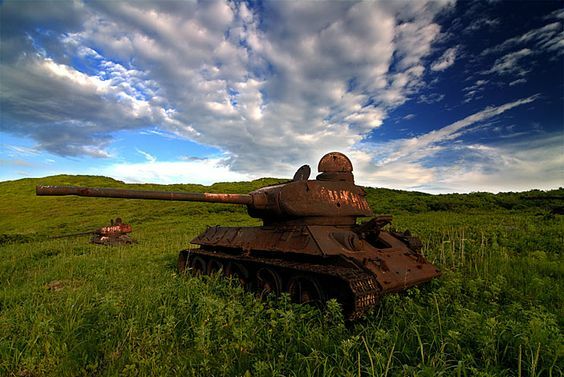 Over the centuries, the harsh wind and the decreasing Anur Lake killed of more trees, and the region became less and less forested. Today only small sections of sparse forest exist, and large sections with remnants of trees, either as large dark-coloured trunk logs partially sticking out of the ground in which they sank, survived the long inundation by Grondheim Lake or as dead fallen trees with branches, lying around as dried husks often stacked near or on each other by the several generations of Ethengars. These wood remnants are used as sources for various reasons; Tools, fire, damming, arrows, weapons, barriers, and nature has made them into its own special environment; small animals hide in them and forage/hunt nearby, others feed upon them, while wind and precipitation very slowly erode them. 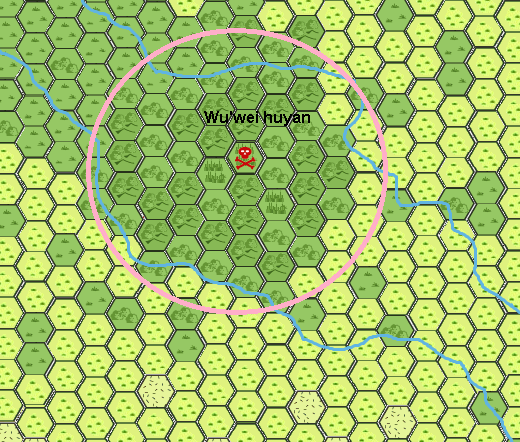 In the nearby future the Aral Lake will increase in size again (exact when is unknown), and will increase the moisture in the ground, and enable new trees to rapidly fill the area, making a forest or even wood, with large areas filled with ancient obstructions; a haven to animals and fairies. Important remark; none of the metal husks (purple stars on map) of the 4000+ years old warmachines will have functional or useful items within. The metal is mostly too eroded to be useful, other than as hiding place for animals, or makeshift club or shank (1d4 damage at best with a break chance of 10% per hit). 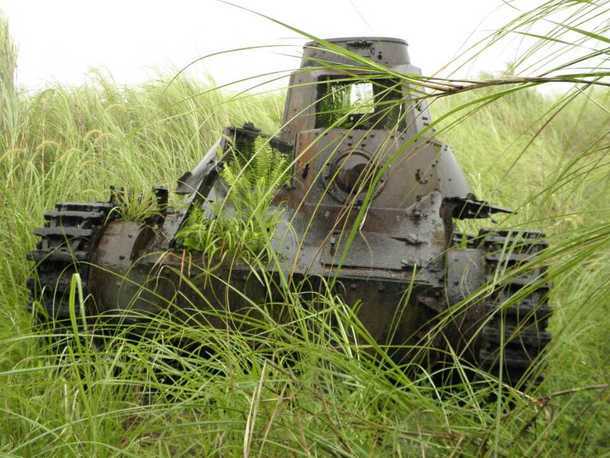 Most loose items have long been used as tool or weapon or became nothing more than metal flaks of rust.. 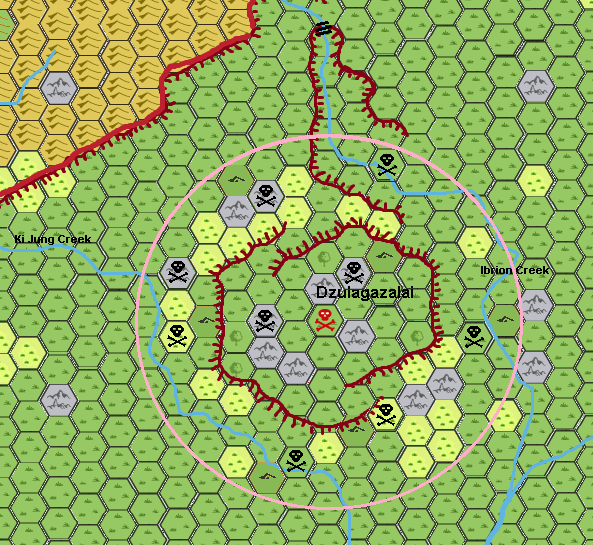 Effects; The area is blighted as the spell and as such anybody within the radius of effect is -1 on Morale, Attack Rolls, Damage rolls. Each individual may make a saving throw each round to avoid the effects, once affected it continues until the area is left behind. A blighted area also causes any perished individual to become vulnerable to either become controlled undead (like zombie or skeleton) or free roaming ghosts with a Phantom (http://pandius.com/Monster_Manual_4.pdf) page 1108 on their place of demise. The area is also habitat to Lesser Phantoms (http://pandius.com/Monster_Manual_4.pdf) page 1107 and Shadows (page 1113-1115) which were drawn in due the proximity of the Spirit Realm and the entropic influences. Typically these undead and shadows do NOT attack if dressed to resemble a shadow, until this individual reveals itself to them as being dressed as such (other dressed person will still not being attacked; these creatures no longer are able to learn from experience). Then there is one single vision roaming the whole area (see page 1309-1310) which will form each new moon, and Hakomon and Shaman know not to enter the area in these days. The last creature (or better said effect) are the many Ghostly Hordes in the area (see page 1120-1121). These are mostly found in the 1 mile hex near the metal husks (purple stars on map). They resemble humans in strange armors and strange weapons firing these and the metal husks towards large amounts of giants coming from various directions. These Ghostly hordes resemble the Vision in many ways and were created due the powerful Entropic magic which was released when the disaster in the southwest happened. Ghostly hordes are active at all days and nights, the vision only the 3 darkest nights around the new moon. The proximity to the Spirit realm enables Shaman to easier communicate with spirits, and when prayed here spirit spells (Spirit Sending, Hold Spirit, Invisibility to Spirits, Fate, Summon Lesser Animal Spirits, Commune with Spirit Lord, Spirit Walk, Spirit Storm, Summon Greater animal Spirit) to once take no place on the amount of memorized spells. This does mean the shaman can use this slot for another (non-spirit) spell. Each of these spirit spells can be memorized only once here. Hakomon find that their control on Undead has been increased to +1 HD per 4 levels (round up) after one hour of undisturbed meditation and that they are invisible to Undead for 1 hour per level of the Hakomon. Spell research on undead or the creation of magical items with necromantic powers is 5% easier per level of the spell to a maximum of 25%. Last edited by Robin on Sat Jan 19, 2019 3:07 pm, edited 1 time in total. Hope you like these, as they not only explain the differences on the map, also add some interesting (historic) locations. More will come up with the other maps. unrecorded (known by tales only)Effect; Minor and forgotten, something that also lures Purple Worms is assumed. Control is assumed. 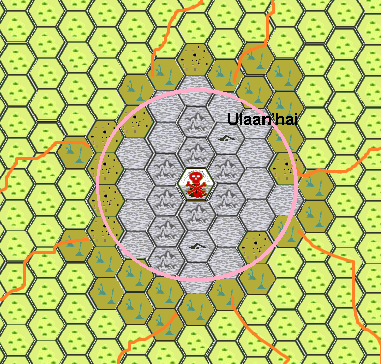 Wandering Monsters; as Normal for Ethengar barren area, including higher chance of Purple Worms. unrecorded (known by tales only)Effect; Time and Water(exact effects unknown). Sometimes a Hakomon from centuries ago appears, speaking in old dialect, seeking knowledge. They have however normal (or less) life expectancy and only old knowledge, and all suffer constant mental stress and homesickness. Residence of at least 3 Nucklavees; Buhrja’da dei min, Kum jongha Datein, Sempi Sempa Datei (all +5HD of normal). Wandering Monsters; Zombies, Skeletons, Ghouls, Nucklavee, Zombie Wolves, Nightmares, Zombie Centaur, Crows, Raven, Large Raven. Holds; Ruins of Blackmoor Colony village Cornwell. Several tools found here tell this was once a harvest area. Active since; 1700BC (unknown if it was a natural magical location before 3000BC). Early recorded effects 3000BC; Abundant growth of grain…however these records also speak of new grain created and used here. Legend; Here giants are born. Sphere of Influence East; 0 was 9 mile radius. Inactive since; 710BC(west) and 725BC (east) respectively. unrecorded (known by tales only)Effects; unknown and not culturally important enough to have made any significance. unrecorded (known by tales only)Effect; Time and Water (exact effects unknown). Holds unknown Blackmoor colony village ruin covered in salt. Inactive since; Magically 515BC Geologically/Environmentally still active. unrecorded (known by tales only)Effect; Matter(Salt) and Water (exact effects unknown, Petrification suspected). Wandering Monsters; Normal for Ethengar Arid area. Rumors exist of Salt Zombies in those days (normal zombies with a salt crust and severe dehydration spawned bt the local magic---as the magic is gone, so are the zombies. Currently used to harvest salt stones for the animals in winter to replenish lost minerals. 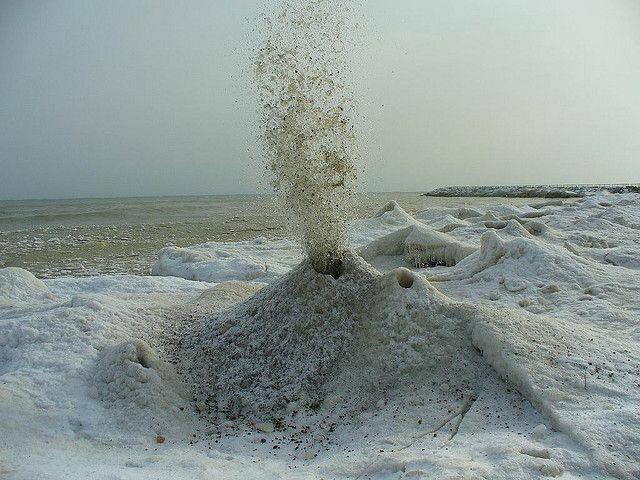 The Davsny nuur (Lake of Salt) and Davsny gol (Salted Creek) are also extreme salty and can’t be used for consumption. Many animals (and stupid humans) who do die within a mile of 4 due dehydration. The caves found here are geological formations and never explored due the dehydration effect of the air within (1 hp damage due dehydration per round!). Outside the dehydration effect is only 1hp of damage per hour, or per Turn if drunk the local salted water. The salinity has decreased to non damaging levels when it passes Clan Nomidai, yet still tastes salty. As these are all dating 3000BC or earlier, not much will remain; metal and stone remnants, rarely something useful. The materials have eroded due wind, water and sand, and animals and plunder. It is near to impossible to deduct the use of the structures, as these often had technomagic properties. To find items still functional in the purpose they were made for is not possible at all, yet improvised use (club, tool, and component) is still possible, even though the items are fragile and weak. 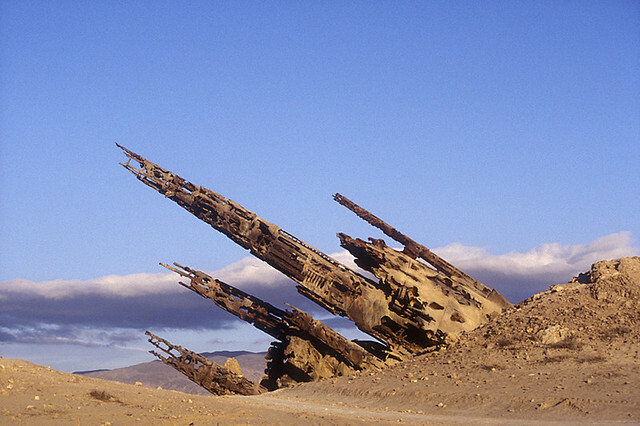 Including these are metal shipwrecks (in the former river or lake beds), sunk either before or during the Great Rain of Fire, found in the region of the Old Anur/Grondheim lake and even in the river beds of the Krandai or the toxic/Seasonal river from World Mountain. Not only holding structures of the Karghthyne nation, with its recreated technomagic, but also small structures were erected by the few settlers of the region elsewhere (Dwarf, Ethengar Human, other Human, Giant). Nearly anything is destroyed in 1700BC due indirect effects of the Great disaster of that era, or by war, and conflicts earlier (or later), or by erosion. However, as several Karghthyne locations have become Hakomon locations due the weird magic used there combined with the entropic and Spiritual effects triggered with the 1700BC disaster. The Dwarves have settled the southern hills, and have battled often with humanoids and giants. Giants had taken residence in the area of the today Broken Lands and although most of them perished in the event, many would have survived in the nearby mountains. Incoming Humanoids make (or overtake) their own settlements, and often abandon these with ease (due various circumstances). In the west many ruins are Glantrian settlements of various form, mostly overrun by Ethengar Invaders. The same applies to the North and east. In 2300BC known as the Ruins of Layhash. Although I have to wait for our Chimpman his input, I could already add some of his information together and create this simple Photo manipulation. Hope you enjoy this tease. Of course as soon as Chimpman helps me filling in the important missing bits of information this Hakomon location will be finished soon thereafter. Adopted and adjusted by time(its is now 3300years later or more) from the 2300BC setting by Chimpman and Geoff Gander. 2360 BC; the Elder of Layhash stopped sending her tithe of troops and supplies to Kairhyeld Gatherhold. Instead she began building up her own troops and augmenting them with beastman mercenaries from Urzud. Engdyr Heldfyst and several other Elders learned of her plot before she could launch an attack against Kairhyeld. Their combined forces marched upon the traitor, destroying her forces utterly. Unknown to most, Layhash and many of the dwarves serving her, were all changelings of Grondheim fostered on the estate for decades previously. The Estate of Layhash was built around and within the remains of a giant crater deep in the heartlands of the Syrlhin Plains. Formerly a jagged wall of colossal stones ringed the outer rim of the crater, pierced in three locations by pairs of tall circular towers. The circular towers are now ruins, the colossal stones have toppled or even fallen apart, leaving behind areas of Broken Land. Formerly steep, now eroded gentle slopes define the inner edges of the crater before flattening out into a more gentle bowl-like basin. In the centre a group of wooded hills circling a large ruin of the old the estate’s main mansion. An ancient beast still lies in the north of this location, its remaining bones fully embedded in the eroded crater walls. The skull is enormous, with twin fangs each as long as a spear, jutting downward from the beast’s toothy maw. 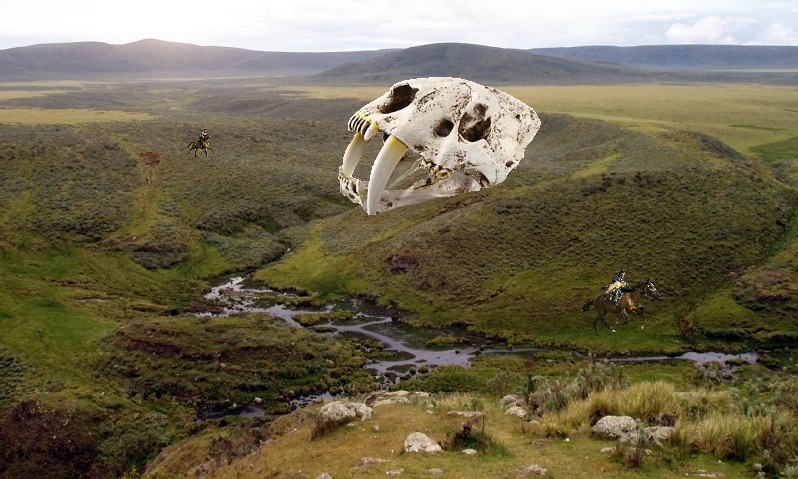 The skeleton of a gargantuan saber-tooth tiger has been buried here even before the arrival of the dwarves in this region, its bones bleached white by the unforgiving sun over the aeons. Little more than a curiosity to the estate’s former inhabitants, A Troll-witch had taken a special interest in the discovery in 2300BC. The witch spend most of her time inside of the once great beast’s skull. Torwenna had mostly abandoned her minions to their own devices, and focused all of her attention on trying to animate the creature’s bones for her own designs. She was very close to success, but due the meddling of some adventurers she completed her ritual and brought the skeleton to life in her defense. Due to its sheer size, Torwenna was only be able to animate only one of the ancient creature’s claws; one Giant Animated bone Claw THAC0 14, HD 4, AC 5, hp 52 (half damage from piercing weapons), gives 2d20 impact damage to all in 20’ radius of target minus AV each 2nd round after animation. It has a reach of 100 feet from the skull in all directions except the right side where it is only 50 feet. Today (1000AC+) the Skull is the home to a small group of Hakomon attempting to understand what did happen here in ALL ages past. They recently rediscovered the research notes of Torwenna the Troll Witch, and although largely damaged, they succeeded to repeat the ritual. As most bones have eroded beyond use or are buried too deep, only the single claw Torwenna used 3300 years ago can be used, this is also buried, but only a few inches deep. They haven't tried to anymate the claw as of 1010AC. 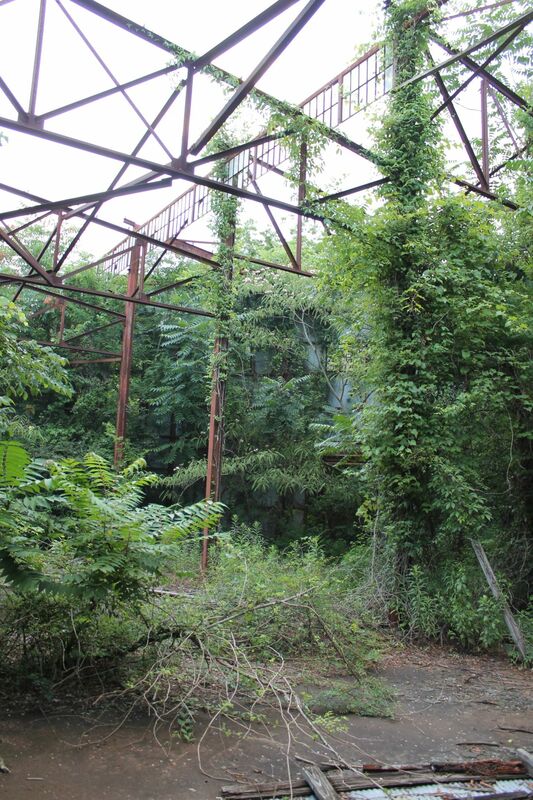 The picture reveals the weathered skull towering a 30 feet from the ground being 22'x38'in size. Ok the map and an earlier description of the location by our Chimpman allowed me to create the next Hakomon location. The map will be updated later. Used by; Shaman, Hakomon(they rarely tread any further than the ruins), and at least one ükher Khün (Ethengerian for Vulture Man=Nagpa). By Chimpman; this estate was founded shortly after dwarves moved into the region, by Dahyk Bargdah, a recent immigrant from Karlheig. The center of the estate features several unnaturally shaped mounds among which the dwarves built their stronghold. Only a few dozen feet beneath the surface lies the husk of a gigantic creature whose body at least partially shapes the mounds on the surface. For decades the dwarves of Bargdah have been burrowing into the ancient corpse, harvesting its flesh, bones, and even in places its ichor. The components were greatly sought after by those practicing the arts of conjuration, enchantment, and necromancy, although the dwarves of Bargdah were often difficult to deal with, many of whom were afflicted by otherworldly voices and strange images that no one else could see. The villages just on the edge of the area were once dwarven settlements with long gone apparatus to draw upon the external magic, and work on the material delved. No one knows what did happen thereafter, for there are no scriptures, runes, or even tales of survivors telling more than what is above. The dug sites had been closed, and camouflaged, the ruins became unimportant, and no trace of anything important was evident. 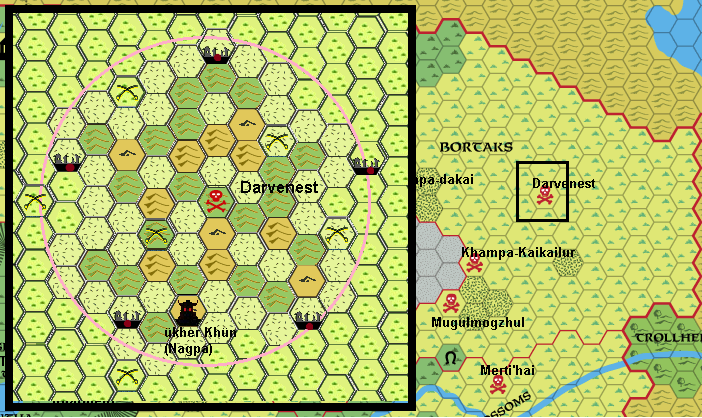 The magic of the location was rediscovered by the Ethengar about a decade after the great disaster of 1700BC, when the scent of rot permeated the region, as the disaster had reopened the dwarven camouflaged entrances. Through the broken chalk bricks, undead dwarves appeared. It took the Hakomon and Shaman all powers they had to stave off this massive force of Undead at the cost of many (visible by the battle-site location on the map). The dwarves eventually gave up, retreated, and Hakomon and Shaman combined closed the pits hence the dwarves came from with boards, clay and magical wards. From this moment on the region became known for emanating powers the mind. Recent History; It is unknown to the Hakomon, Shaman and the common Ethengar, but the ükher Khün (Nagpa) Fersi-Ty ‘Langbeak’ (original fugitive of Heldann mage persecutions already in 973AC) discovered this area by scent and soon noticed the peculiar locations of the ruins as being the points of a large pentacle. Further research by this creature, revealed the pentacle is indeed some kind of ward, created aeons ago (2300BC yet this is unknown even to him), yet of Dwarven origin. When Langbeak discovered this he was agashed; dwarven magic? That could not be. He discovered the small caves, barred with boards, Hakomon & Shaman sigils and magic; nothing he could not dispel with his expertise (he is a 12th level Nagpa) and items. The scent he followed was that of Rot, a minute trace, a whisp, old, with a taint of magic. Within the boarded caves, he discovered these were ancient dwarven-style tunnels. The scent of Rot was very clear, yet also very old, more than several weeks. As he entered these he noticed instantly he had entered a single long curving and twisting tunnel in two directions. The tunnel was 30 to 40’diameter and the walls were ribs, topped with a spine on top, keeping the tunnel as it was. The dwarves who had dug the flesh out, must have had a reason for it, as they cemented the bones wth the earth while removing everything else. Most remaining organic matter had dried and mummified to a petrified stage over the ages, yet its scent was all over, slowly escaping to the outside. The entry he opened, probably was not the only one. Eitherway, the process of decay, breached by lack of fresh air was now in affect again.. This stuff was older than several weeks, maybe even centuries older. There was also an almost palpable aura of magic. Evil Spirits seemed to spawn here, yet these did not bother Langbeak. Why he did not know, maybe they shared alignment or an equal goal.Up to this date Langbeak investigates the area and notes his discoveries. He encountered Dwarven Undead, Evil Spirits, and since recently some pesky Harpies, also attracted by the scent, like the vultures, rats and other vermin. Effects; Unknown to any the decaying brain of the creature is in the middle of the area. Although long dead, its last thoughts and powers are still stored within the skull. It not only has increasing magical effects on all necromantic magic, it also changes any one slowly to Chaotic Evil. For every 1000 Turns of a magical adept creature of less than 9HD (aka Humans, Demihumans) meditating or residing here, it changes one step closer to Chaotic evil (Lawful to Neutral, Good, to Neutral, then Neutral to Chaotic or Evil). It is up to the DM which last thoughts this creature (probably a gigantic Burrower) emanates and if they affect PC’s or NPC’s alike and how. Langbeak is already chaotic and evil, hence he is unaffected. The undead dwarves continuously regenerate in 48 hours, even if disintegrated, destroyed by destructive turning or else. The souls (still within) are in torment and anguish and blame the living for their ordeal. Only their destruction will release these souls and grant the PC’s experience for their defeat. The ‘positive’ effects are components found within which give an increase in effects of conjuration, enchantment, and necromantic item creation, memorization rituals or even in the spells itself. Mostly these are bones, or mummified (now rotting since re-exposed to the open air) hunks of flesh. Most other material is long gone. Langbeak will eventually discover the Brain. By doing so he gains an absurd amount of information (aeons of life the creature had), and an increase in all his magical (+50% range, duration and effect, casting time -10%, necromantic abilities +100% range, duration, effect, half casting time. Instantaneous and permanent spells unaffected, minimum casting time half the spell level at best). Only true Heroes then might be able to stop Langbeak, or to hinder or even prevent this to happen. This could expand over several adventurers by a clever DM. When the brains are removed or destroyed, this location loses all magic in less than a month, however, the component usage can continue for a minimum of 2 decades, and may become an Ethengar trade source for several years. The Undead dwarves also remain until defeated, as they no longer regenerate. Sphere of Influence; 5 mile radius, Sphere of Entropy only!! Undead Dwarves can be found here;http://pandius.com/Monster_Manual_4.pdf page 1192 Remark these undead regenerate due the entropic powers emanating from the brain, and any Experience is only gained upon their treu destruction. As you see I still work on these locations.